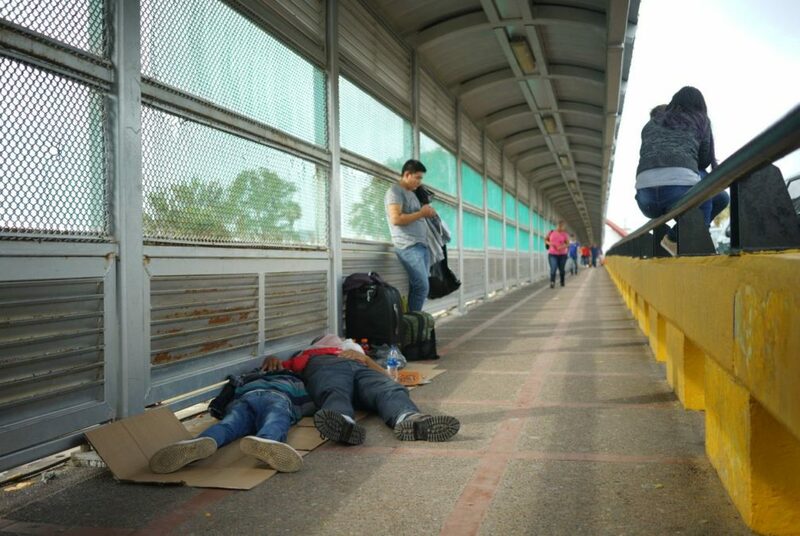 Immigrant families seeking asylum in the U.S. sleep on the Mexican side of the international bridge connecting Brownsville, Texas, to Matamoros, Mexico. MATAMOROS, Mexico – On Sunday and Monday night, 22-year-old Marcos Samayoa slept on pieces of old cardboard on a concrete sidewalk. He was perched above the Rio Grande, surrounded by a small pack of strangers on the international bridge that connects this Mexican border city to Brownsville, Texas, with his dusty green backpack and an old pair of sneakers. A few yards away, on the Texas side of the line, three U.S. Customs and Border Protection agents watched. It had been a long journey from Samayoa’s hometown of Mazatenango in southwest Guatemala. And now he was just short of that line on the bridge, where the agents had stopped him. They told him to wait; he didn’t know for how long. So he did. Because his wife and four children had successfully crossed that line sometime earlier and he needed to find them. Samayoa said Tuesday that he didn’t know where they were, only that they had been separated after they surrendered to American agents. Samayoa was one of about 15 people who camped out all day Tuesday on the bridge — a major border crossing on the southern tip of Texas. Most had been there for at least two nights; one family of three, two brothers and their aunt from Honduras, had arrived Saturday. Children as young as 3 slept on the cardboard sheets, clutching pink teddy bears that a frequent crosser had bought for everyone and distributed in passing. Last week, U.S. Attorney Jeff Sessions ruled that the federal government would no longer grant asylum to immigrants who claimed to be fleeing gang or domestic violence. And those who are allowed to cross the international boundary and request asylum are being separated from their children and sent to detention centers under a recently implemented zero-tolerance policy that has ignited fierce national blowback. Samayoa said he’s one of the asylum seekers fleeing violence in his home country. Back in Guatemala, he said he had a small business selling ceviche, a popular dish made with raw fish. Gangs would extort him for money, Samayoa said, and he had received death threats. If he could just wait it out here on the sidewalk, watching tourists and workers stream by, maybe he could eventually enter, apply for asylum and be reunited with his family. Jenifer Figueroa was waiting, too, with her 3-year-old son, Angel Bonilla. A few weeks ago, she said, three men knocked on the door of their house in the port city of La Ceiba, Honduras, and said she would have to sell drugs for them or they’d kill her son. Figueroa said she left that night, paying a “coyote” – a professional people smuggler – to take her to Matamoros. She didn’t expect to be stopped halfway across the bridge. 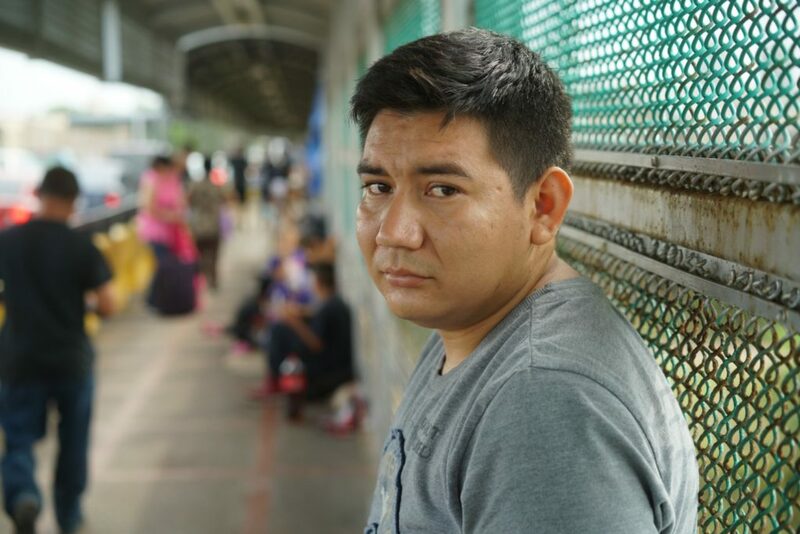 But she said she felt confident that the agents eventually would allow her and her son to enter the U.S. For now, all she can do is sit on the bridge and wait while Angel, who was developing a cough, slept as peacefully as he could by her side. The agents posted on the bridge and those in the processing center on the Brownsville side declined to answer questions about the drama playing out in the center of the bridge. As the zero-tolerance policy has taken hold this month, the protests are coming from all sides of the political spectrum. In a letter Tuesday to President Donald Trump, Texas House Speaker Joe Straus, a San Antonio Republican, called for an end to that policy, saying it is “worsening the many problems that already plague our immigration system, and it is important to recognize the critical difference between those who come to our country seeking asylum from very dangerous situations in their home countries, and those who enter the United States as part of a criminal network or in order to harm our citizens. “Please listen to the growing number of Americans, faith leaders and elected officials from both parties who are voicing our concerns about this growing crisis,” Straus wrote. Back on the bridge, as the temperature climbed, the families barely moved from their perches. A steady stream of border crossers brought pizza, Doritos, bottled water and soda – so much so that Figueroa started to roll her eyes in frustration. “There’s too much,” she said. “Get your things,” the agent told him — and suddenly the boy, his brother and their aunt were allowed to cross the invisible line. Samayoa watched the scene with curiosity. He didn’t understand why he hadn’t been chosen, but it gave him hope that eventually, the agents would let him pass. So he waited some more, eager to cross the line and find his family. “This is our only option, to come here (to the bridge), because we have nowhere else to go,” he said.